This is a friendly, well-kept pub in Cellardyke. It has reasonably priced meals and good beer. The Haven is a welcoming restaurant for dogs and families with children. The Waterfront in Anstruther serves great food with first-class, friendly service. Sample the extensive menu of adult and children’s meals, and enjoy the view out to sea while you eat. A cosy, dog-friendly traditional pub in the centre of Anstruther, popular with both locals and visitors. 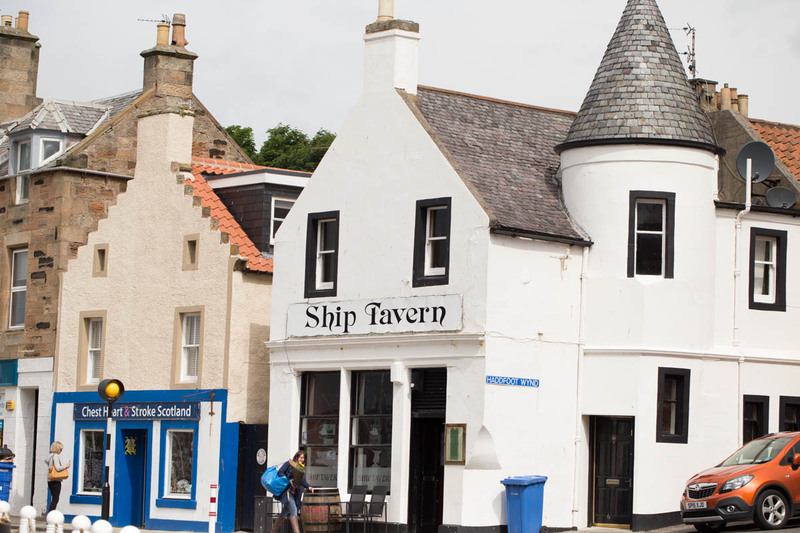 The Ship serves a wide selection of real ales, malt whiskies and old fashioned pub food. One of the best Indian restaurants in the local area. Eastern Touch in Anstruther has a mouth-watering menu of classic Indian curries, bags of atmosphere and great service. The Boathouse in Anstruther is a smart bistro serving a good selection of seafood dishes. There is also a bar with a good wine list and a decent cocktail menu, so we’ve been told. With amazing food, extensive wine list and intimate atmosphere, the Cellar in Anstruther is a classy, fantastic restaurant. Take that someone special for a meal for two, or to celebrate a special occasion. Quite simply the finest fish and chip shop for miles around, this is the place to go locally for traditional fish and chips. The Anstruther Fish bar is rightly famous in the area for its tasty, locally caught fish and has won a number of awards. It has also been graced with royalty. Prince William has eaten here in his days as a student at St Andrews University. These are only a few of the many bars, coffee shops, cafes, restaurants and pubs. Many are within easy walking distance of Silverdyke Caravan Park. Whether you are in the mood for a traditional Scottish pub grub, pizza or a decent curry, let us know and we’ll be able to point you in the right direction. If you are interested in staying with us then please give us a call today on 01333313098 or contact us via our online form. You are in for a tasty treat!